From A-Z, the Arab Spring is Fake. 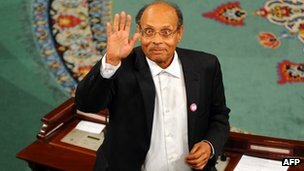 December 13, 2011 - The BBC hails Tunisia's assembly and their election of a new president in their article, "Tunisian activist, Moncef Marzouki, named president." What the BBC predictably fails to mention is that Marzouki's organization, the Tunisian League for Human Rights, was a US National Endowment for Democracy and George Soros Open Society-funded International Federation for Human Rights (FIDH) member organization. Marzouki, along with his Libyan counterpart Abdurrahim el-Keib, formally of the Petroleum Institute, sponsored by British Petroleum (BP), Shell, France's Total, the Japan Oil Development Company, and the Abu Dhabi National Oil Company, makes for the second Western proxy installed into power either by covert sedition or overt military aggression, during the US-engineered "Arab Spring." Western proxies in Egypt including Mohamed ElBaradei and Mamdouh Hamza are also vying for power in the wake of similar foreign-fomented unrest, while NATO backed militants harbored in Turkey are attempting to overthrow the government of Syria by force. Gene Sharp of the Albert Einstein Institution penned the book "From Dictatorship to Democracy," originally designated for the destabilization and recolonization of Myanmar, still called "Burma" throughout much of the West. Sharp's book would be utilized by the Central Intelligence Agency (CIA) throughout Eastern Europe, throughout Asia, and eventually, in 2011, for the US-engineered "Arab Spring." According to Sharp's own Albert Einstein Institution (AEI) 2000-2004 annual report, AEI had been sponsored by the US government's National Endowment for Democracy (NED) and its funded subsidiary International Republican Institute (IRI) to train activists in Serbia (page 18) Zimbabwe (page 23) and Myanmar (page 26) to help overthrow their respective sovereign governments. Australia's Southern Cross University's "Activating Human Rights & Peace (AHRP)" conference had put out a revealing account of their 2008 proceedings illustrating that all of Gene Sharp's work, beyond what was even mentioned in his own institution's annual report, had been fully funded and in support of the US government and its global domineering agenda. Beginning on page 26, Sharp's affiliations, in particular with the National Endowment for Democracy, which is described as carrying out "a lot of work that was formerly undertaken by the CIA," as well as the Ford Foundation, and billionaire Wall Street patriarch George Soros' Open Society Institute are fleshed out in immense detail. The "Arab Spring" itself was not spontaneous, nor was it indigenous. 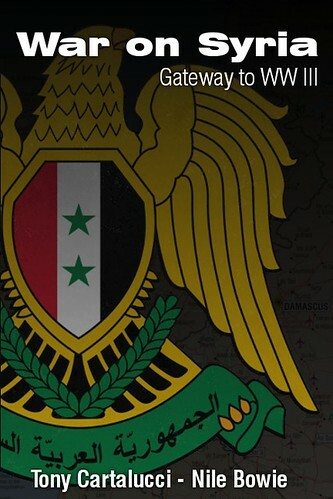 Rather it was a was a premeditated geopolitical plot engineered by US corporate-financier interests years in advance. The New York Times in its article, "U.S. Groups Helped Nurture Arab Uprisings," clearly stated as much when it reported, "a number of the groups and individuals directly involved in the revolts and reforms sweeping the region, including the April 6 Youth Movement in Egypt, the Bahrain Center for Human Rights and grass-roots activists like Entsar Qadhi, a youth leader in Yemen, received training and financing from groups like the International Republican Institute, the National Democratic Institute and Freedom House, a nonprofit human rights organization based in Washington." Further confirming this were public statements made by the US State Department-sponsored "Alliance for Youth Movements" (AYM) counting Egypt's April 6 Youth Movement among its above mentioned inaugural AYM summit attendees in New York City as far back as 2008. Foreign Policy magazine admited that April 6 received further training from CANVAS in Serbia, before fomenting unrest in Egypt. FP magazine would also report that "CANVAS has worked with dissidents from almost every country in the Middle East; the region contains one of CANVAS's biggest successes, Lebanon, and one of its most disappointing failures, Iran." The destabilization in Iran, of course, was drawn up by corporate-funded Brookings Institution, as articulated in its "Which Path to Persia?" report, with the actual mechanics of organizing the foreign-funded revolution subcontracted to organizations like US-funded CANVAS, NED and its subsidiaries. In an April 2011 AFP report, Michael Posner, the assistant US Secretary of State for Human Rights and Labor, stated that the "US government has budgeted $50 million in the last two years to develop new technologies to help activists protect themselves from arrest and prosecution by authoritarian governments." The report went on to explain that the US (emphasis added) "organized training sessions for 5,000 activists in different parts of the world. A session held in the Middle East about six weeks ago gathered activists from Tunisia, Egypt, Syria and Lebanon who returned to their countries with the aim of training their colleagues there." Posner would add, "They went back and there's a ripple effect." The ripple effect Posner is talking about is of course the "spontaneous" "Arab Spring" and bears a striking resemblance to the campaign of destabilization Gene Sharp and AEI perpetuated throughout Eastern Europe as described in detail in the above mentioned AHRP report. With a similar gambit now playing out in Russia, fueled by the exact same Western organizations and foundations, not only is it obvious that Tunisia was overthrown, not by spontaneous, indigenous protests, but rather premeditated foreign-funded sedition carried out by the likes of Moncef Marzouki and his US-funded opposition group, it is also obvious that Tunisia was just one of many nations destabilized in the largest concerted geopolitical reordering since World War II. 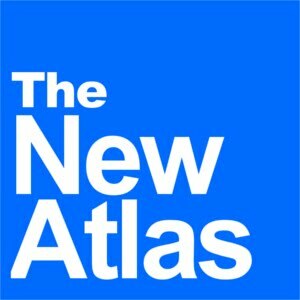 With Russia now targeted by foreign-fomented color revolutions, the US' declaration of a new "American Pacific Century" aiming to contain China, and Western proxies beginning to climb into positions of power throughout Northern Africa and the Middle East, it is clear that the campaign of encirclement and destabilization of both Russia and China by the forces of global corporate fascism described in February 2011's "The Middle East & then the World" is indeed an unfolding reality. It is a necessity to research the backgrounds and affiliations of all political groups and NGOs, and assess both their funding and their affiliations. The National Endowment for Democracy is indisputably disingenuous in both their stated cause and their actions. Their board of directors alone betrays their motto of "Supporting freedom around the world," as it is almost entirely made up of corporate-fascists, Neo-Conservative warmongers, and corporate lobbyists. The organizations, opposition groups, media outlets, and NGOs, they support seek to destabilize and destroy the nations they infest. Exposing and fighting this disingenuous enterprise is important. Equally important is to identify the corporate-financier interests driving its true agenda and the global elites' overarching plan of achieving global hegemony. Boycott these interests entirely out of business, and replace them with business models, institutions, and bodies of governance that truly serve "we the people."